‘Wuxi and Lake Tai’ by Wu Guanzhong. ©Ashmolean Museum, Universtiy of Oxford. The Sullivan collection has been bequeathed to the museum by Professor Michael Sullivan (1916–2013) who died in September. 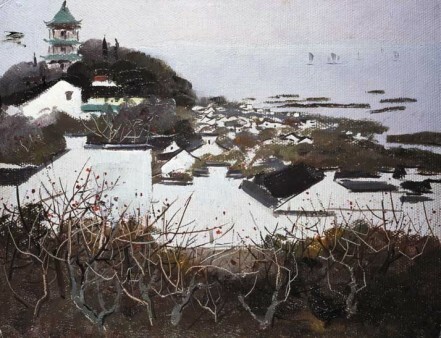 It comprises more than 400 works of art amassed by Professor Sullivan and his wife, Khoan, from the 1940s, and represents works by the principal artists of late 20th-century and contemporary China. A large part of the collection has never been exhibited in public. Professor Sullivan was a world authority on modern Chinese art and an emeritus fellow of St Catherine’s College, Oxford. His pioneering study, Chinese Art in the Twentieth Century (1959), was the first book to address the subject. His writing on the art and archaeology of China and south east Asia from the 1960s onwards was the result of extensive travel and relationships he established with the artists and scholars of those countries. He was appointed Lecturer in Asian Art at the School of Oriental and African Studies (SOAS), London, in 1960, and was Professor of Asian Art at Stanford University from 1966-1984, during which time he was the founding holder of the Christensen Chair in that subject. He combined this work with his passion for bringing eastern art to a wider audience, producing articles for BBC publications and broadcasting on the radio. When Professor Sullivan retired to Oxford in 1985, he was the pre-eminent scholar outside China on 20th-century Chinese art. He continued to write and lecture until his death and, the month before he died, had visited Shanghai for the launch of the translations of his three major works. In 2012 he was awarded the American Friends of Shanghai Museum’s Award for Excellence. The award, which is bestowed once every two years, honoured Professor Sullivan’s lifetime contribution to the study and preservation of Chinese art. With characteristic generosity, he used the prize grant to purchase an extraordinary object for the Ashmolean’s permanent collections – an early 20th-century ‘Scholar’s Rock’. Key to Professor Sullivan’s understanding of the subject, and to the collection of Chinese art which he built with Khoan, were the friendships he made with artists both in China and abroad. Many of the painters represented in the collection were the couple’s close friends and the paintings they acquired were often gifts. Among the most important pieces in the collection are works by Qi Baishi (1864–1957), Zhang Daqian (1899-1983), and Fu Baoshi (1904-1964), and more recent acquisitions including ‘Landscript’ (2002) by Xu Bing (b. 1955). Some of the works have been loaned and displayed over the years at the Ashmolean in the Khoan and Michael Sullivan Gallery, which opened in 2000. In March 2014, the museum will show a new selection of works in a small commemorative exhibition titled ‘Michael Sullivan: a Life of Art and Friendship’.